I did not put a post up last week. I realize this error. I do not particularly feel bad about it. I have been sick or have felt ill for the past week and a half; and while actually being ill was not enough of a hindrance to post my to-be-completed list, recovering from said head cold was enough to put a halt to creating a new post. Returned I have, though, to give you more exciting insight into the life of Rebecca! This week’s post has to do with books. This is the first real book post I have made and I am super excited about it, because I get to show you all of the books that are putting me into a tizzy by not being able to read them all. at. once. I have to start out saying that I can only read one book at a time. When I was younger I became disenchanted with reading multiple books at a time while reading the Children of the Lamp series and The Clique series. I was mixing up plotlines and characters; it was a mess to say the least. Because I can only read one book at a time (except for that time back in October, but I will get to that in another post), I have a long To Be Read list. I mean, it is really long. Maybe not for some, but it is for me. Just warning you now, this post will be very picture heavy and extremely wordy. Now, instead of just giving you a list of books I have that need to be read, I figured why not put pictures in too? It makes it a little more exciting, at least for me. Although, I have no idea about you dear reader. 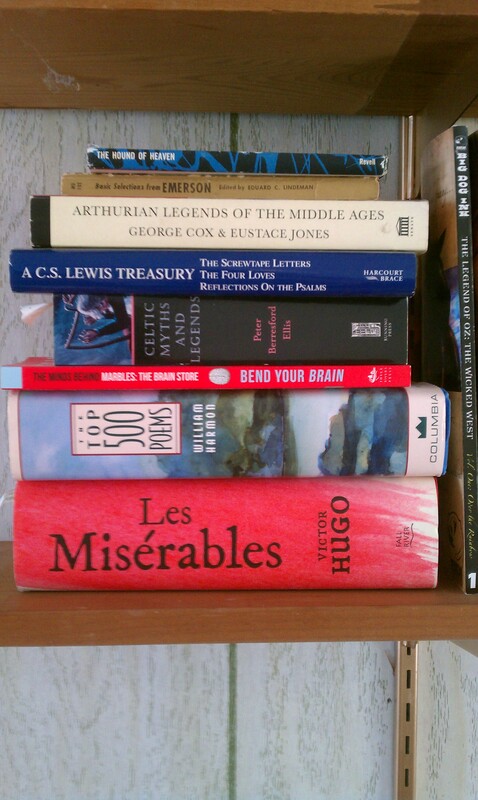 This is my non-fiction stack. From top to bottom, the books that are there are: The Hound of Heaven by Francis Thompson; Best Selections from Emerson; Arthurian Legends of the Middle Ages by George Cox & Eustace Jones; A C.S. Lewis Treasury; Celtic Myths and Legends by Peter Berresford Ellis; Bend Your Brain from Marbles: The Brain Store; The Top 500 Poems by William Harmon; and The Brick – ahem- I mean, Les Miserables by Victor Hugo. Yes, I understand that Les Miserables and Celtic mythology are not non-fiction, but they got lumped in that stack so it will have to do for now. Someday I will have enough room for a mythology section. The Brick will probably have its own damn shelf. Now here is a lot of books. This is my fiction section that has yet to be read. 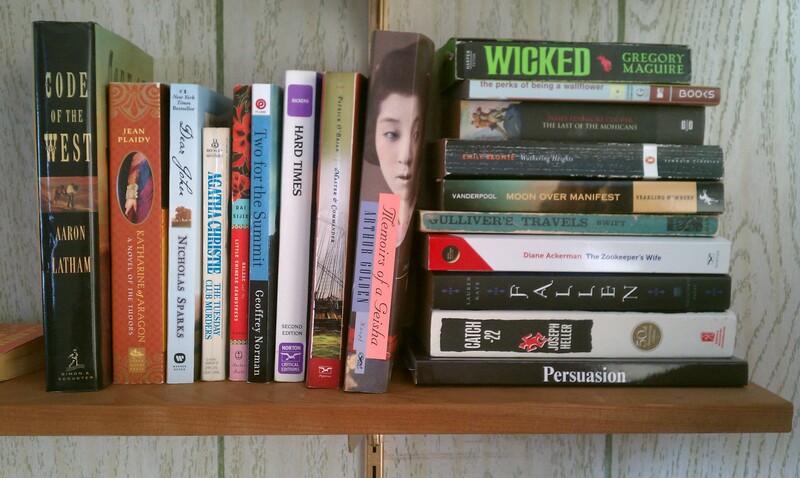 From left to right: Code of the West by Aaron Latham; Katharine of Aragon: A Novel of the Tudors by Jean Plaidy; Dear John by Nicholas Sparks; The Tuesday Club Murders by Agatha Christie; Balzac and the Little Chinese Seamstress by Dai Sijie; Two for the Summit by Geoffrey Norman; Hard Times by Charles Dickens; Master and Commander by Patrick O’Brian; Memoirs of a Geisha by Arthur Golden. And from the stack on the right, from top to bottom: Wicked by Gregory Maguire; The Perks of Being a Wallflower by Stephen Chbosky; The Last of the Mohicans by James Fenimore Cooper; Wuthering Heights by Emily Bronte; Moon Over Manifest by Clare Vanderpool; Gulliver’s Travels by Jonathan Swift; The Zookeeper’s Wife by Diane Ackerman; Fallen by Lauren Kate; Catch-22 by Joseph Heller; and last in the stack, but certainly not least, is Persuasion by Jane Austen. Do not leave yet, there are more books!! 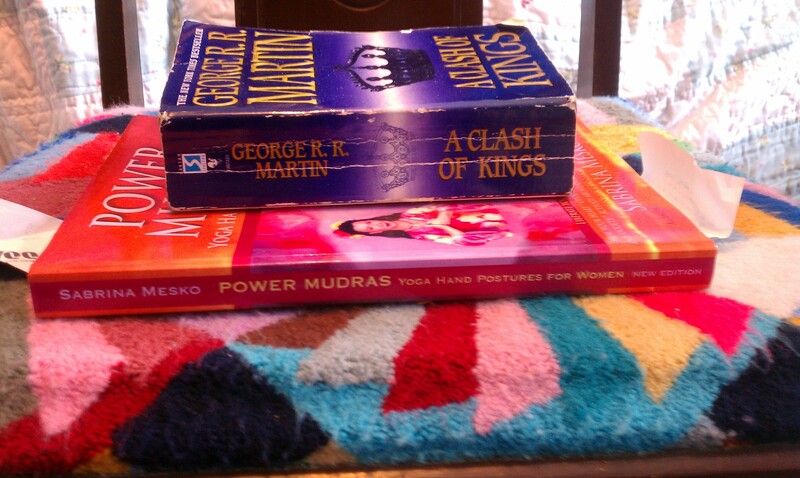 The last small stack includes a book called Power Mudras: Yoga Hand Postures for Women by Sabrina Mesko. 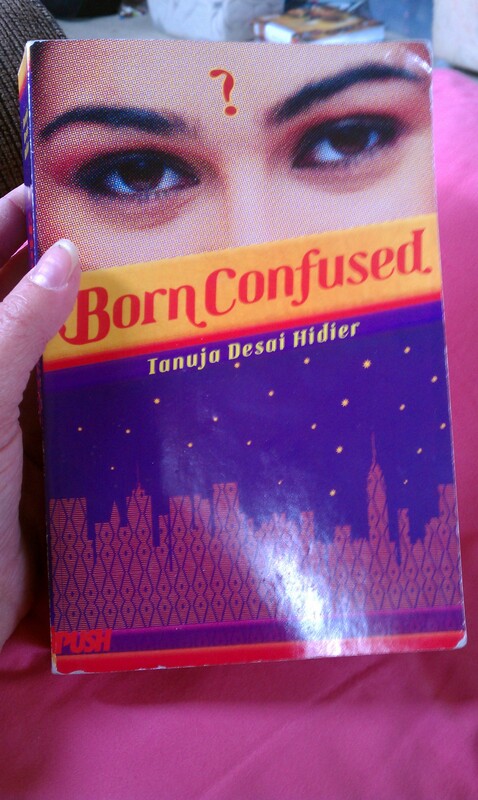 This book is one that I received after winning a Goodreads giveaway. It was like an early birthday present, because it came six days beforehand and I have been reading it off and on since in the attempt to learn the hand postures. Thank you Sabrina Mesko! The other book is A Clash of Kings by George R.R. Martin. It is the second book in the A Song of Ice and Fire series. This book was given to me by my aunt. It is called Way of the Peaceful Warrior: A Book That Changes Lives by Dan Millman. Another book I have to read is called The Last Lecture by Jeffrey Zaslow and Randy Pausch. I am actually half way through that one, and have to find it again in order to read it. 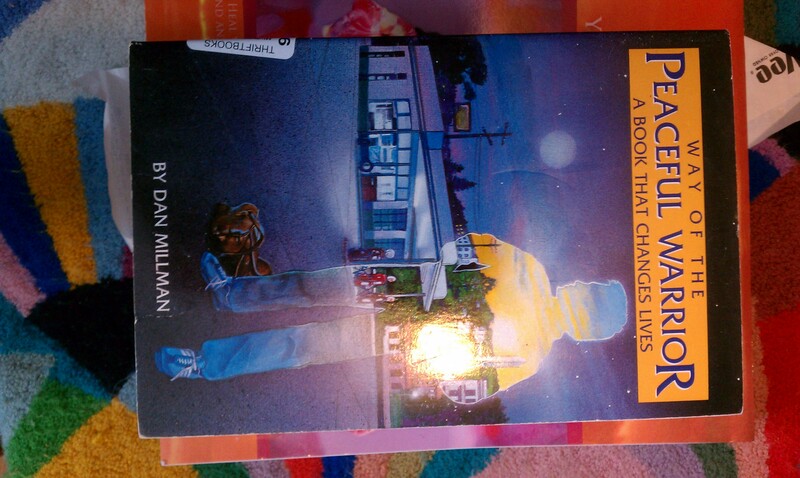 And last, is the book I am still reading. I truly wish I had more time to read, because this is a wonderful book. I will be posting a review of it as soon as I am finished with it. I am not even close to being halfway through it, but I look forward to having more time to read over the summer. Lately, I have been flitting from school book to school book, project after project, and then some. I have been fatigued since winter set in and it leaves me with little energy to do anything other than comfort knit. It may sound silly, but it is true. I have no motivation to do anything whatsoever. I do sometimes read before my classes start, but I usually get there with just enough time to spare and it is not quiet enough for me anyway. 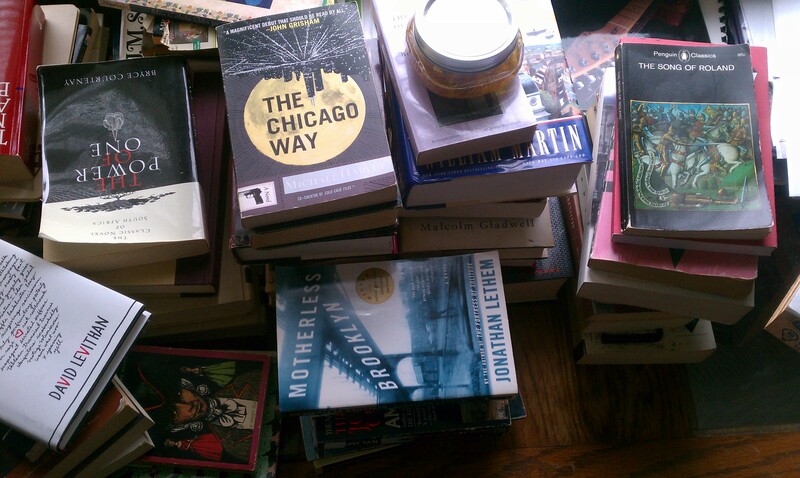 Plus, just for giggles, here is a completely different collection of books that I am still sorting through. Keep, giveaway, sell? Who knows. There are forty books there and I get dizzy looking at them. That is all I have for you guys this week. I hope to see you all next week. Remember to like, comment, and follow my blog! Please and thank you. See you all soon. oh.. and if for some reason, you’d like some books on tape/cd i’ve got like 5 boxes you can pick from.